As the story goes, Zubin Mehta, conductor of the New York Symphony, sat down one evening to read Solzhenitsyn’s The Gulag Archipelago when after reading a few pages he rose, walked into the bedroom, and emerged again wearing his tuxedo. He then sat back down and continued reading. His reason? One must always honor great art. Hear the rhythms, the melodic interplay of vowel and consonant—quite moving apart from its meaning—the container and the contained, form and content—all in perfect harmony. These words can be tasted and not one is wasted. 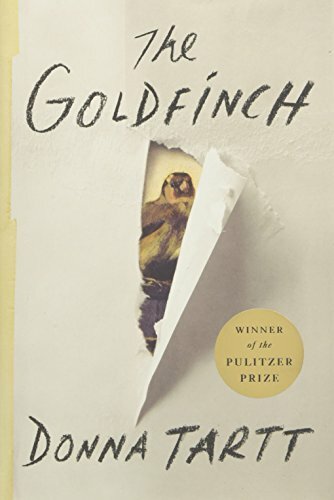 The Goldfinch is written as a memoir tracing Young Theo Decker’s journey from a middle class condo in on 57th street in Manhattan, through the decadence of Las Vegas to Amsterdam. It is a decades-long journey that revolves around a small painting that comes into the teenager’s possession almost by accident. After a terrorist bombing that destroyed a large part of a major art museum in New York and kills his mother, Theo is directed by an old man, a total stranger, to take the painting and preserve it. “The Goldfinch” was one of the few paintings by 17th Century Dutch painter Carel Fabritius to survive a powder explosion in Deft that killed him, destroying his studio and most of his work. It is considered one of the greatest tragedies in Dutch history. “He was Rembrandt’s student, Vermeer’s teacher,” Theo’s mother tells him just before the explosion. Similarly, all of the characters in Ms. Tartt’s novel are chained to their fates by seemingly insignificant choices made in response to enormous tragedy. In Theo’s case, it is the choice to not accompany his mother to the gallery that bore the brunt of the explosion. It was also his decision to follow the old man’s entreaty and take the painting out of harm’s way. From this moment onward, the painting is Theo’s perch. He could turn it in immediately, but he doesn’t know how, so he decides to keep it. The longer he holds it the harder it is to return it. He fears arrest for art theft. He doesn’t know what to do with it. Yet there are many reasons he devises to make it impossible to give it up. Each time he looks at it, the goldfinch seems to challenge him. What that challenge is takes Theo 20 years to discover. It is rather like an addictive drug no less powerful that the ones he experiments with in Las Vegas with his new friend, Boris. Boris and Theo are studies in contrasts. While Theo is careful and bound to the rules of civility, Boris is one of those anarchic boys who abandon what should be in favor of what is, living fully in the moment without regret for the past or fear for the future. He is Theo’s heyoka, the trickster in mythology, the figure who challenges his dearest beliefs and habits. It is Boris who seeks to break Theo’s chain. It is clear from the beginning that this is not just a mystery surrounding the theft of a priceless work of art. As with Dostoyevsky’s Raskolnikov, we see the world through Theo’s eyes: its shallowness, greed, depravity, and ignorance, his own weakness and obsession, but also the world’s wonders and its ultimate justice. The girl he encounters in the museum, whom he eventually knows as Pippa, the girl who lamented the goldfinch’s chain becomes his beacon of light, his Sonia, as it were, or his Beatrice, Beatrice with bright red hair, pale, almost translucent skin, a crooked smile, a limp, and a survivor’s panache. Music is her life, but after the explosion that almost kills her, the explosion that takes her music from her, she yet sees great beauty in life and a faith in herself that moves her onward. She is his inspiration, and no matter how crooked and chaotic his path, she is always there to draw him back. Other characters are no less compelling and no less influential on Theo as he grows into a middle aged man. The old man who put the painting into Theo’s care before he died is called Welty, and his business partner Hobie takes Theo in after he has run the gamut of social services, becoming his mentor in the furniture restoration business. Hobie is a truly engaging character, endearing in his innocent obsession with wood and utter ignorance of business. Theo also comes under the influence of a wealthy upper class family run by Samantha Barbour with whom he stays briefly after his mother’s death. Other characters move in and out of the narrative, including his estranged alcoholic father and his girlfriend, but no matter how much or little they have to do with the story, all are clearly drawn with their own disparate voices and worldviews. As with Dostoyevsky, it is impossible to detect the author’s voice; what we hear is Theo’s and his perceptions of all the other people in his life. We only know what Theo knows. In fact, we are well into the novel before he identifies his gender or his mother’s name. The only people whose names we know are servants. Unlike the author, Theo does have a point of view. What is the result of his journey between the chaos of Boris and the luminous Pippa? How does he reconcile his experiences with reality? Not only is The Goldfinch a compelling mystery with enough action to keep us turning pages, it also is one of those novels whose greatness lies in those moments in which we pause, catch our breaths, and sigh, “Aha!” Ultimately, as James Joyce observed, that is the only true response to great art: to simply be in its presence and to be in awe. It is that which makes us want to dress up while reading this miracle of a novel.